Live Stock Gaps, Technical’s, and Anomalies. It’s really strange how somethings work. 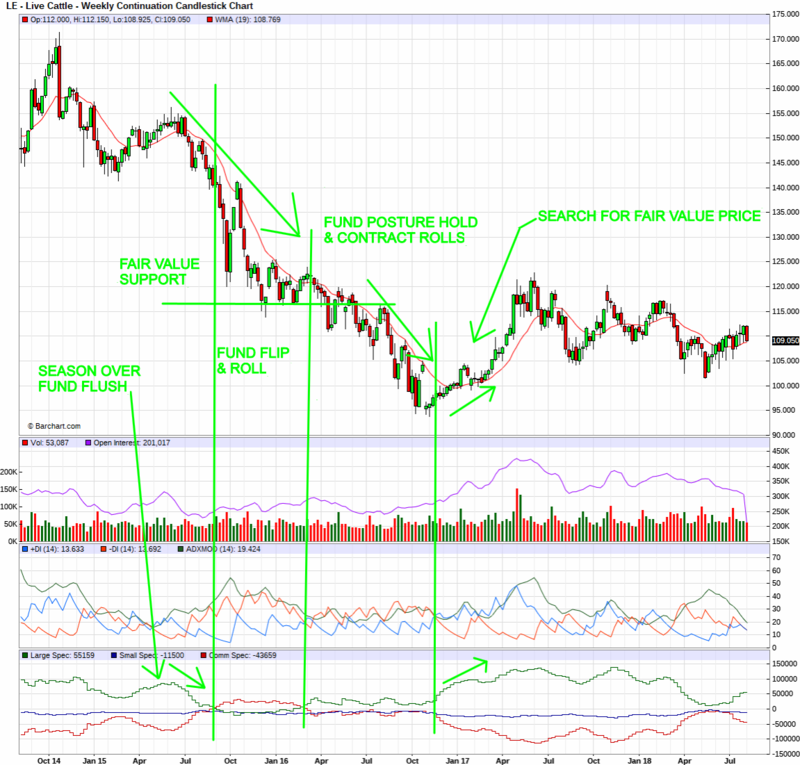 Ya never know which platform will have the most accurate information especially when it comes to futures. When trading the Live Stock futures it’s super important to expect weird anomalies. So what to do when setting up your continuous daily/weekly charts? I donno! The market manipulation is crazy and it usually has nothing at all to do with fundamentals. 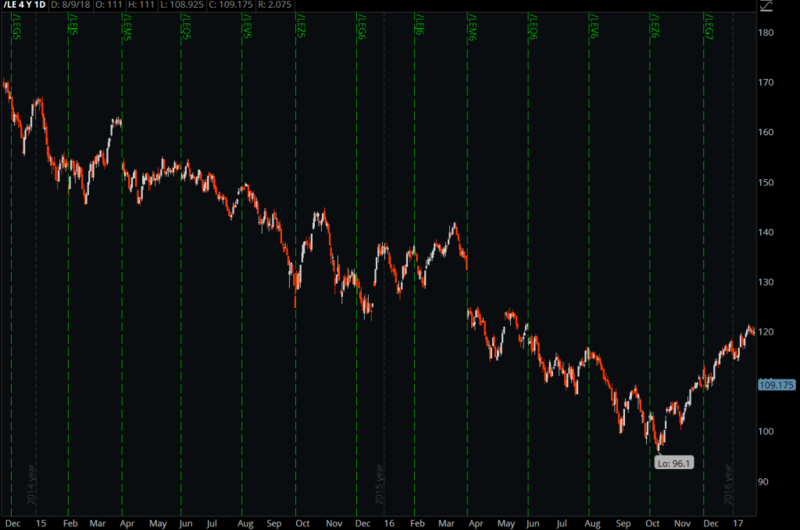 A lot of weird seasonality things happen, and they all correspond with rolling from contract to contract. Let’s look at some charts! The important one is at the end but lets start with Live Cattle and what happened in 2015-2016. We can see that there was a fundamental that drove price up in 2014 then the big funds took profits until they actually started holding a neutral position, or when looking at the legacy COT report we see a short position what I like to call a “Fund Flip” since the fund flip we saw a little rally and traders trying to “catch the falling knife” but continually got ran over for the entire year of 2016 because of the fund’s resilient posture. We did get back to a fair value price but there was a massive backwardation in the future spreads which is kind of an inside trick that the funds use to jack everyone I think. They will hold the short or neutral posture and continue to drive down price even though the fundamentals were telling a different story. Fundamentals don’t matter. Technical’s do. Now if there were a big fundamental to drive up price then it would be a different story but in this case it was a normal market condition. So learning first hand how commodities tend to work, you have to wait for the commodity to prove itself and even then sometimes it can’t get the price to rise, so in most cases the funds will just keep shorting the market till it’s lowest price, even well below fair value. Here we can see all the contract changes. Drive price down till it hits the DEC at the lowest point. Everyone thought price would hold the 120, then the 110, then the 100, then finally after everyone got completely sick of trading it and getting crushed, the mid 90’s, and then BOOM! Now let’s take a look at Lean Hogs. Front month getting crushed when no ones looking at the back month’s. I’ve heard very experienced traders talking about buying the V contract at 57 to trade back up to the upper 60’s but I think they forgot about something… Now the V trading 48! 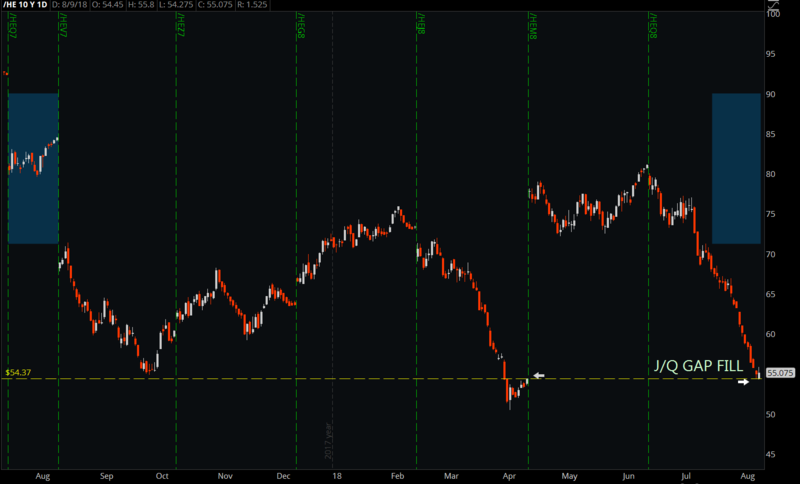 which was my target all along because I was thinking it would push the DEC down to the bottom which is 43. Now for a technical anomaly. Some platforms make different rollover dates, which is when the active contract changes. Here we are looking at a weird anomaly with TD Ameritrade’s Think Or Swim platform which is probably the most popular out of most. 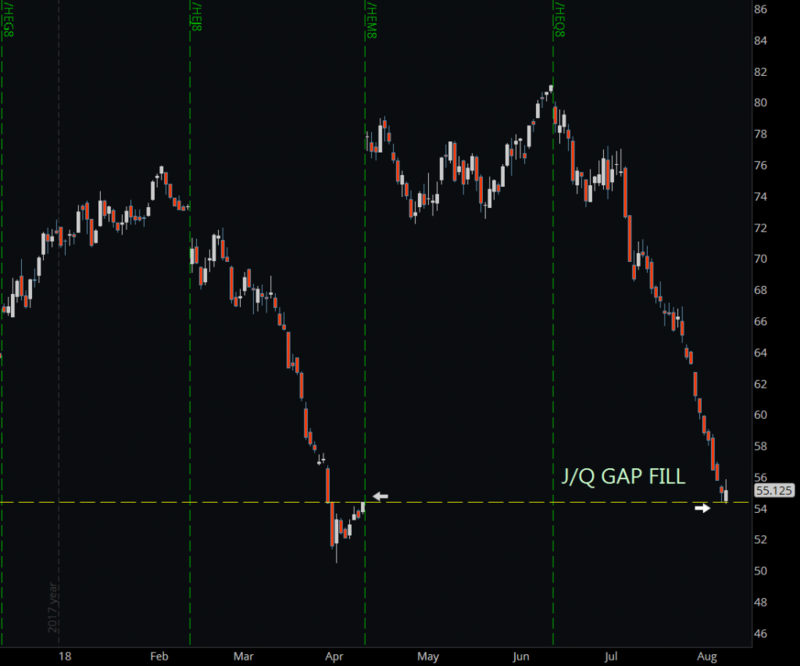 The price filled a crazy big gap between it’s J contract and the Q before finding a bounce. Something kept driving down that price to fill that. Other platforms rolled their active months sooner. So how did TOS see that? I don’t know but let’s look at another weird anomaly. Here we look back in time at the Q contract. Notice anything weird? You should cause there was about twice as many days in the Q contract in 2018 than in 2017 via the TOS platform. Don’t ask me why, maybe you know? 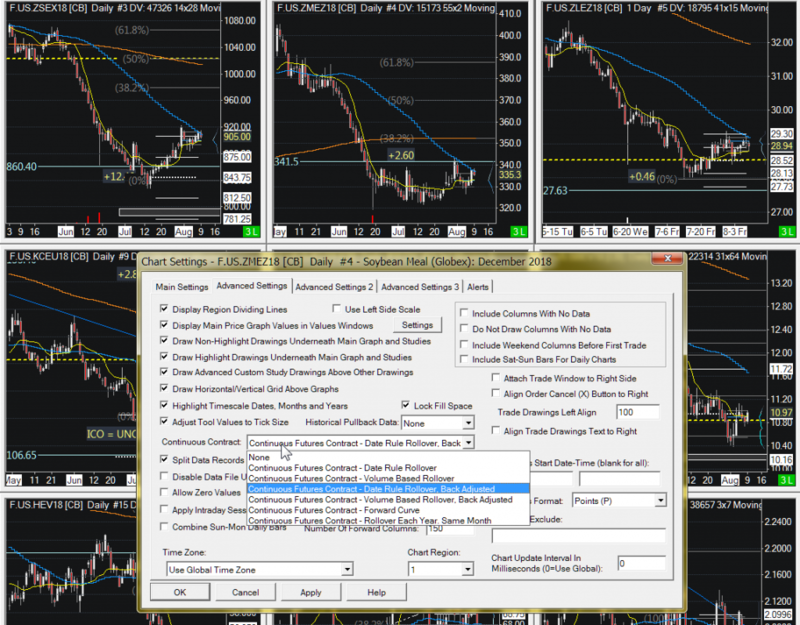 With other platforms you see different ways to setup your continuous charts, so what to choose? With Sierra Chart you have a bunch of different options. I’ve been using the “Date Rule Rollover, Back Adjusted” and it seems to work good with the moving averages. The other’s will jack them up. So WTFrig! CQG makes the V go active on the 7/27 and TOS is on 8/10. Can’t we all get along..? This is crazy. But anyways, if you use good spread charts like the ones I offer free on my site then you should be doing ok for the most part, as far as negotiating most of the madness. Bottom line is that the price movement in a normal market condition can be manipulated so much that you can’t leave any stone unturned. Always watch the spreads and COT on all commodities and always, always, expect the unexpected. Have you noticed me talking about this on Trade Buddies Live for the last month..? So much info your going to puke! A while back while seeking information on spreads I was trying to find charts for them and there didn’t seem to be any floating around the web that were easily accessible and current. I was pretty much forced to build spread charts in my platforms. Over the past year I’ve been watching them very closely and just recently I have expanded them to 4 different contracts per chart which is HUGE! The information is amazing. The main important information is the Volume and Open Interest. This allows you to see when the funds are starting to build new positions. Once you know when they make their move you can see what direction they will be building. So when the roll out of the front month contract occurs they will be flushing out of it and building into the back months, and it’s not always in the very next active contract. The information is all in your face but you can’t read the information without charting it. I mean you can do it without the charts but that’s only if you can constantly do math in your head all day long on many different trading instruments. 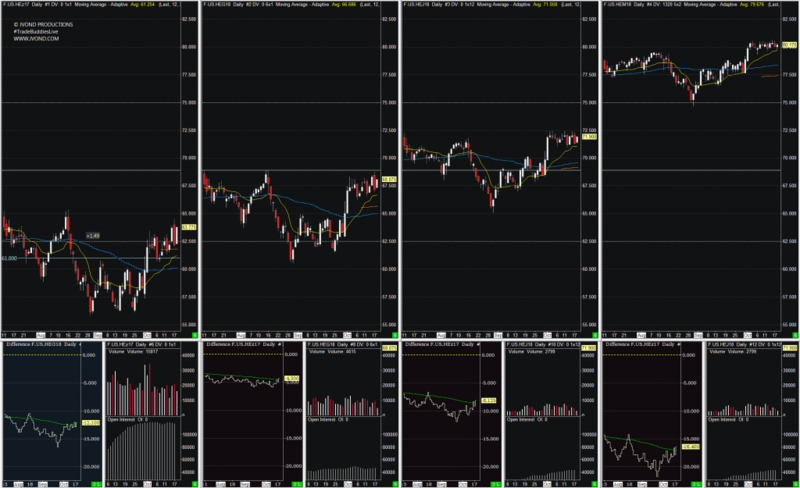 Well, let’s face it, you need charts… So I setup my charts to plot the spread price action of the front month against the next 3 contracts via the chart below those later contracts. Below the front month contract is actually the 2nd and 4th contracts spread. This hog spread charts shows you exactly why there are so many crazy gaps and huge price spikes on continuous daily charts. You will NOT be able to ride the HEZ7 contract to 90. 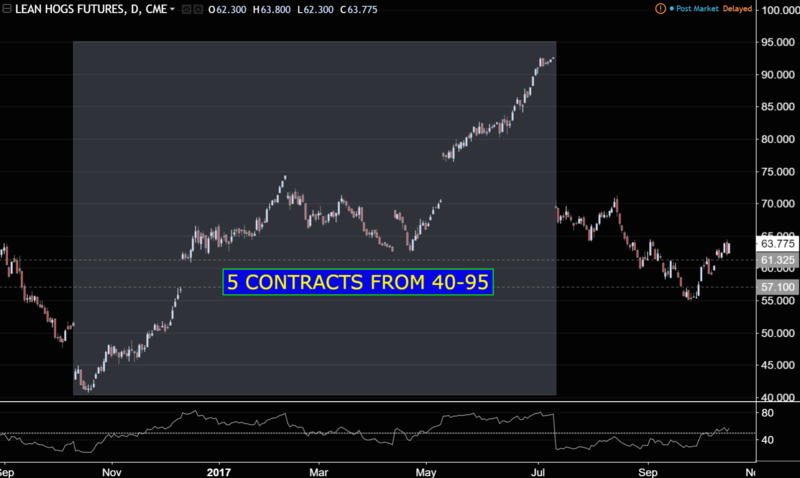 The only way to trade hogs to 90 would be to buy all 4 contracts then maybe a half year later your 4 contract trade may be trading 90 if your lucky and the distance sum of the 4 contracts would equal that. Like, buy the 4 contracts at the same time, right now! Hopefully you can ride the Z from 63-68 then sell it there near the expiration, and you have previously bought the G contract for $68 at the same time you bought the Z and you try and ride that one from 68 to 75 till that one rolls, etc, etc… So it’s virtually impossible to trade those huge price spikes on a single contract. Now maybe if a catastrophe like a hog disease kills off half the hogs you may be able to ride that contract up $20 but that’s a very rare occurrence. Above you can see how the different contracts make the price action seem crazy but once you know what is behind the craziness it all makes a lot more sense. Now you know the secret! or at least a little more of what my thinking is. But of coarse I’m not a trading professional , and I didn’t learn this from anyone so I can’t say if the info here is good or bad but I’m just trying to figure it all out one day at a time. Shoot me a comment if you think you can add anything. Thanks! 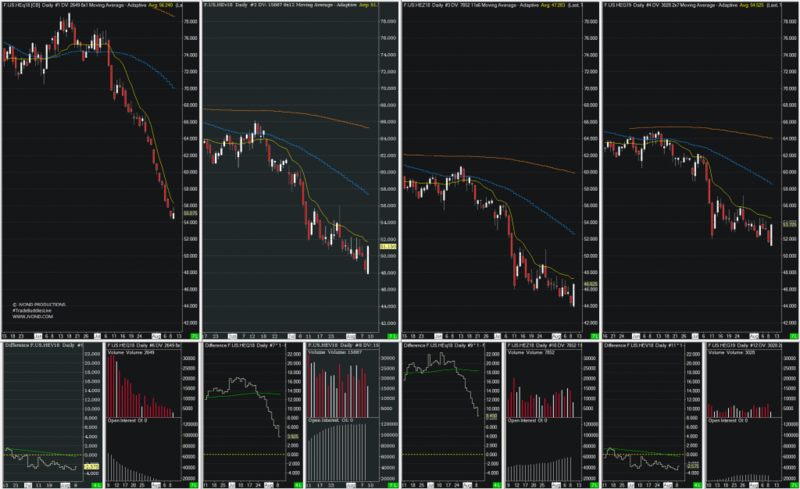 Feel free to visit the #TradeBuddiesLive page and you’ll find 12 spread charts and a whole bunch of other great trading resources.